Xerostomia is defined as the sensation of oral dryness and is often a symptomatic manifestation of hyposalivation. Xerostomia may indicate the presence of alterations in the function of the salivary glands and an elevated risk of oral complications. Symptoms and consequences associated with hyposalivation include difficulties in speech, swallowing and tasting, and a significant increase in the rate of dental caries and other oral infections. Although hyposalivation can be caused by a variety of conditions (head and neck radiation, Sjögren’s syndrome, medications, etc. ), its main symptom, xerostomia, is common to all these disorders and only varies in intensity. Therefore, the treatment is not specific, and therapeutic management is similar in all cases, regardless of the cause of xerostomia. Traditional modes of treatment include oral palliative care (saliva substitutes, mouthwashes or gels) and salivary flow stimulants (pharmaceutical or taste products). Lately, electrostimulation has been added to the available therapeutic arsenal. The rationale behind it is that electrostimulation can simulate, at least partially, the normal physiologic mechanism of salivary gland stimulation. Fig. 1: The site of lingual nerve electrostimulation, lingually to the third molar location, is shown by the dotted yellow circle. The green arrows represent the stimulation conveyed by efferent fibers to the submandibular (SM) and sublingual (SL) glands. 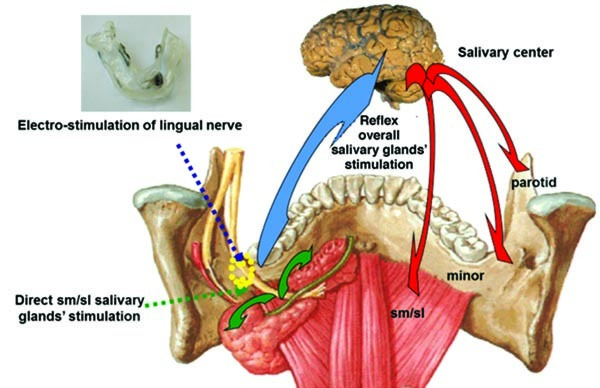 The blue arrow indicates the signal transmission from electrostimulation site to the salivary center, as part of the salivary reflex. The red arrows denote the salivary reflex-mediated stimulation command running through the efferent fibers of the relevant nerves (trigeminal, facial and glossopharyngeal) from the salivary center to the salivary glands (submandibular, sublingual, parotid, minor). Chemical/gustatory stimulation, such as tasting food, conveyed by fibers included firstly in the lingual branch, and then in the facial nerve. Mechanical stimulation, such as chewing food, tactile perception of foreign bodies in the mouth, or movements of oral muscles such as the tongue. Stimuli coming from other areas of the body, such as smelling food. A central connecting and processing center (salivary center in the brain), into which the impulses above are conveyed by the relevant nerves, in particular the facial nerve. Efferent nerve fibers (going from the salivation center to the salivary glands) that carry the imparted secretory command to the parotid glands by the auriculo–temporal nerve; to the submandibular, sublingual and several minor salivary glands by the lingual nerve; and to the remaining minor salivary glands by other nerves. The efferent fibers of the lingual nerve that will later reach and stimulate the submandibular and sublingual glands and also several minor salivary glands. Fig. 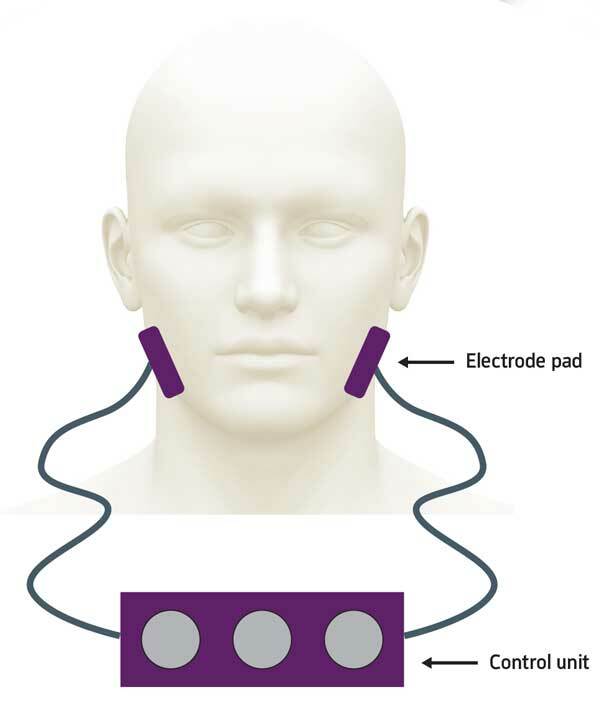 2: Illustrative presentation of the use of a transcutaneous electric nerve stimulation (TENS) apparatus to stimulate the parotid glands by placing a pair of pads containing electrodes on both preauricular areas. Electric cords connect the pads to the control unit used by the patient to modulate the current intensity. Devices for transcutaneous electric nerve stimulation (TENS) are commonly used to treat musculoskeletal problems, in particular pain. 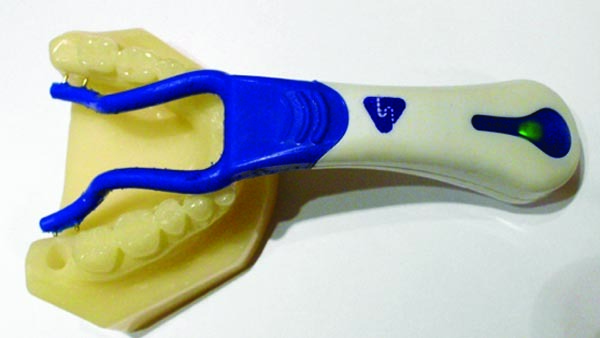 A variety of such commercially available devices has been utilized as experimental tools for stimulating salivary function. The TENS electrode pads are placed externally on the skin overlying the parotid glands, and the TENS unit is then activated (Fig. 2). The current intensity is felt and controlled by the patient, who can modulate it in order not to cause pain. Therefore, no real sham (placebo) can be used in clinical trials, because patients are be able to differentiate between an active and a sham device. Studies have shown that TENS units are effective in increasing parotid gland salivary flow in healthy subjects and xerostomia patients, such as patients that received radiotherapy or allogeneic hematopoietic stem cell transplantation.1,3,4,5 However, general weaknesses of the studies are lack of placebo (sham) control and of subjective parameter measurements. Fig. 3: The Saliwell device seen from above (Fig. 3a) and from both sides. Recently, a device called Saliwell was launched to the American market. 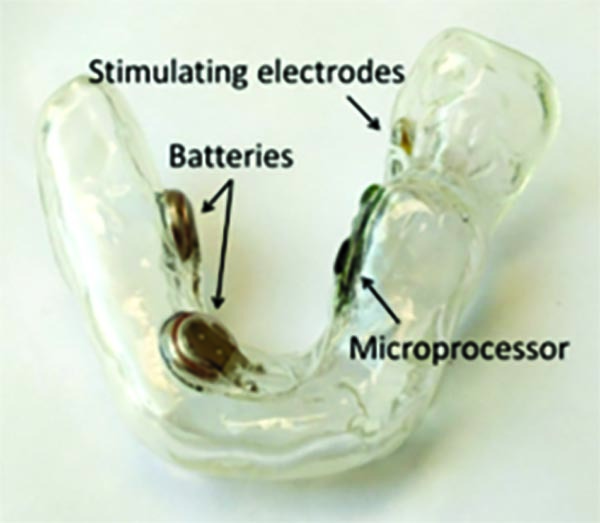 It is a kind of mouth guard that carries an electronic circuit with a microprocessor, a pair of stimulating electrodes and two batteries, all linked together with electric wires (Fig. 3). The electrodes of the device are in contact with the surface of the oral mucosa, which in turn lies at a distance of 1–5 millimeters from the lingual nerve (Fig. 4). The device is used for a period of five minutes, five times a day (Fig. 5). Stimulation current is weak and not felt by the patients. Thus, sham controlled trials can be easily performed, because patients don’t feel any current by either the active or the sham device. The device may be custom-made as shown, or universal (named “SaliPen”) as depicted in Fig. 6. Both intraoral devices are FDA-cleared. Both devices share similar electronic parameters, but SaliPen has electrodes on both sides. This study was extended to an uncontrolled phase, in which the positive effects were maintained during 11 months of use of the device. Moreover, at the end of the trial other subjective parameters such as oral discomfort, speech difficulty, frequency of waking at night and the rate of salivary flow (both unstimulated and stimulated by mastication) had improved.8 Patients starting the trial with no collectable saliva developed during the study the ability to spit saliva. No significant adverse effects were observed. Fig. 4: View from the lingual side of the area of electrostimulation. Fig. 5: A patient wearing a Saliwell device. Fig. 6: A SaliPen device placed on a model. 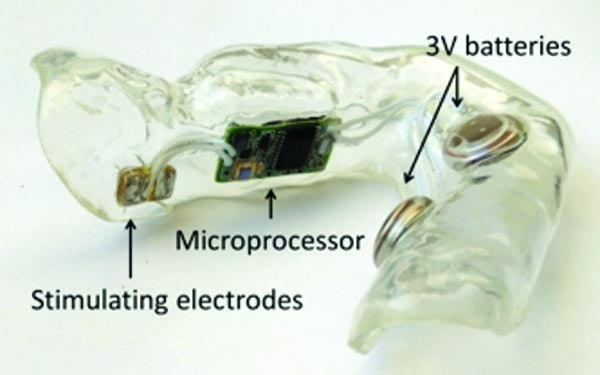 A white extraoral control unit is linked to a blue intraoral stimulation unit, composed of two silicon-made flexible arms, each with a pair of electrodes designed to contact the oral mucosa, lingually to the third molar location. The most important outcome of xerostomia treatment efficacy is the degree of symptomatic improvement achieved, regardless of patient characteristics (e.g., underlying diagnosis, severity of hyposalivation).9 There are very few patient-centered features that can guide the physician in choosing the specific treatment method to use. One of them is the general health status of the patient. In some circumstances, the use of systemic sialagogues such as pilocarpine or cevimeline may be contraindicated. In other cases, the use of these medications induces intolerable side effects. In these cases, other management methods are particularly relevant, such as electrostimulation. 1. Hargitai IA, Sherman RG, Strother JM. The effects of electrostimulation on parotid saliva flow: a pilot study. Oral Surg Oral Med Oral Pathol Oral Radiol Endod 2005;99:316-20. 2. Lafaurie G, Fedele S, Granizo López RM et al. 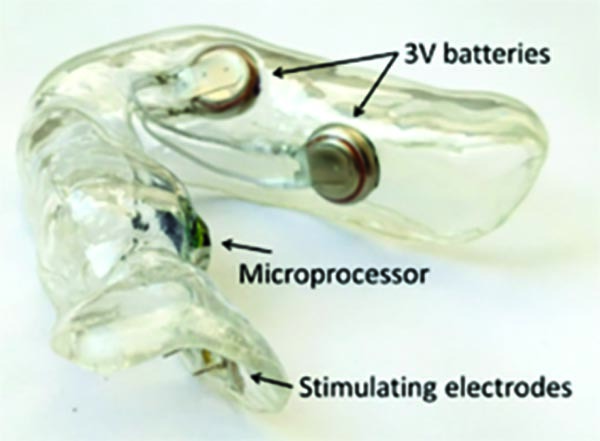 Biotechnological advances in neuro-electro-stimulation for the treatment of hyposalivation and xerostomia. Med Oral Patol Oral Cir Bucal, 2009;14(2):E76-80. 3. Pimenta Amaral TM, Campos CC, Moreira dos Santos TP et al. Effect of salivary stimulation therapies on salivary flow and chemotherapy-induced mucositis: a preliminary study. Oral Surg Oral Med Oral Pathol Oral Radiol 2012;113:628-637. 4. Wong RKW, James JL, Sagar S et al. Phase 2 results from radiation therapy oncology group study 0537. Cancer 2012;118:4244-52. 5. Vijayan A, Asha ML, Babu S et al. Prospective Phase II Study of the Efficacy of Transcutaneous Electrical Nerve Stimulation in Post-radiation Patients. Clin Oncol 2014;26:743-747. 6. Strietzel FP, Marti´n-Granizo R, Fedele S et al. Electrostimulating device in the management of xerostomia. Oral Dis 2007;13(2):206-13. 7. Strietzel FP, Lafaurie GI, Mendoza GR, et al. Efficacy and safety of an intraoral electrostimulation device for xerostomia relief: a multicenter, randomized trial. Arthritis Rheum 2011;63:180-90. 8. Alajbeg I, Falcão DP, Tran SD et al. Intraoral electrostimulator for xerostomia relief: a longterm, multicenter, open-label, uncontrolled, clinical trial. Oral Surg Oral Med Oral Pathol Oral Radiol Endod 2012;113:773-81. 9. Brennan MT, Shariff G, Lockhart PB, Fox PC. Treatment of xerostomia: a systematic review of therapeutic trials. Dent Clin North Am 2002;46:847-56. 10. Sreebny LM, Valdini A. Xerostomia. A neglected symptom. Arch Intern Med 1987;147:1333-7. 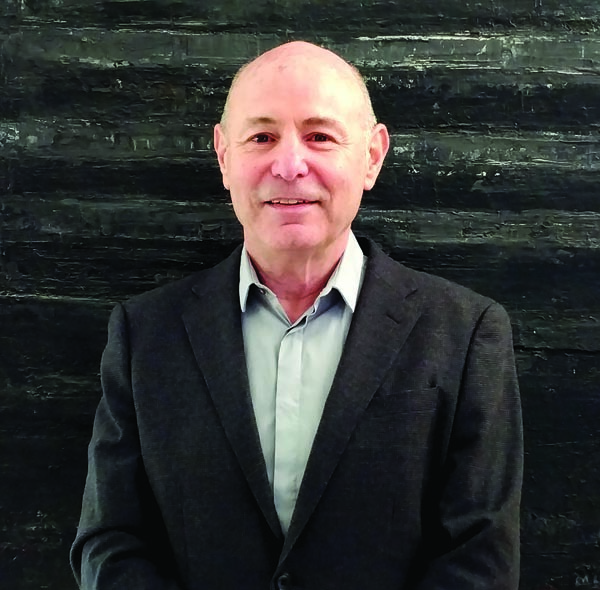 Dr. Andy Wolff, a dentist and specialist in oral medicine, graduated in 1981 from the University of Tel Aviv, Israel, and revalidated his degree at the University of Buenos Aires, Argentina. Wolff has been director of several public dental clinics in Israel, guest researcher at the U.S. National Institutes of Health, director of the saliva clinic at Tel Aviv University, and director of the Department of Dentistry at Assuta Hospital in Tel Aviv. He has been awarded seven research grants from the European Commission budgeted in millions of euros to develop medical devices. He has authored more than 75 publications in scientific journals and five chapters in books. Wolff was the head of the group “Medication-induced salivary gland dysfunction” of the World Workshop on Oral Medicine, sponsored by the American Academy of Oral Medicine and the European Association of Oral Medicine.